August 2, 2016 By Chelsey 53 Comments This post may contain affiliate links. Read my disclosure policy here. Since I was a kid, I have always loved back to school time! All the school supplies and organizing materials lining the stores, and the transition into fall weather and all the holidays! 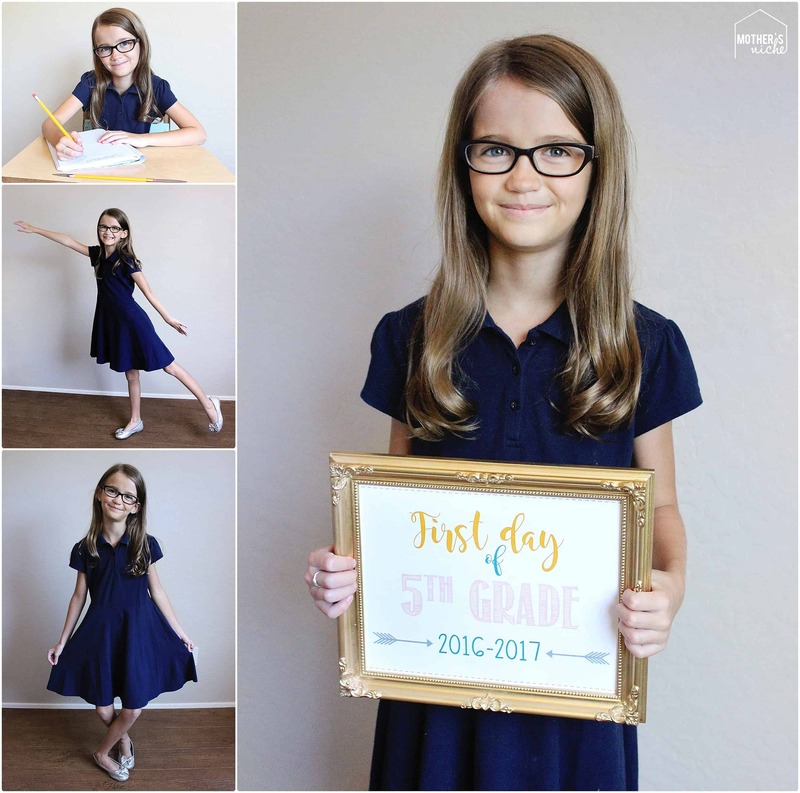 With the rise of Pinterest, a new tradition has entered into many of our lives: Back to School Pictures using First Day of School Signs! My handsome boy decided to grow up and go to Kindergarten today! I watched as my baby boy put his shirt on and buttoned it up. He tightened up his belt and helped to comb his hair, and I realized my baby is growing up. I want to cherish each moment and make sure I keep these memories in my heart and captured them on camera too! So can you!!! So break out your camera. Capture their little personalities every chance you get because they grow up way too fast! 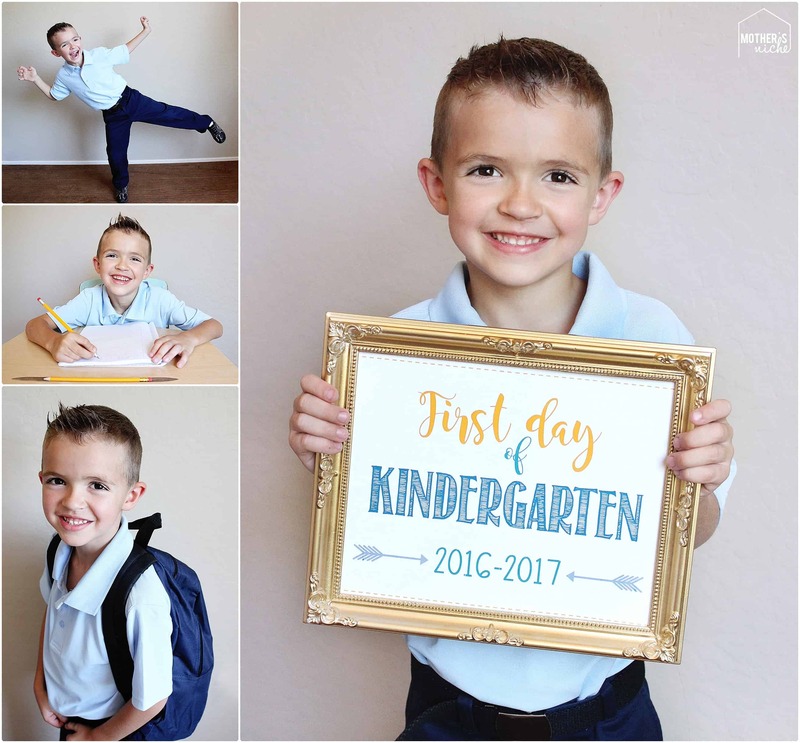 Make sure that you record this special occasion with a First Day of School photo! Print these FREE Signs for your special Day! Big sisters are school experts! I love that they told him every good thing there is to know about school and how much they loved kindergarten. They were there helping him get his backpack at the end of the day. He said they waved to him when the passed in the hall. These girls sure made me a proud mama today. Just click on the SIGN you want and Print the PDF! Signs for Girl and Boy Below! 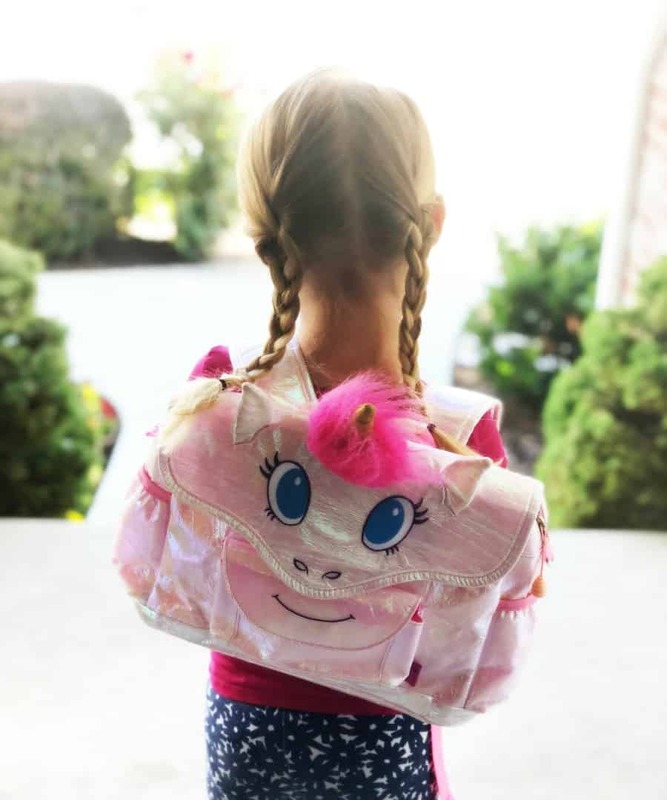 What are some First Day of School Traditions YOUR family does?? These are great! Thank you. Will you be making identical ones for the last day of school? Just what I was thinking! I hope she does make some Last Day versions 🙂 These are adorable! Hi- do you have a boys Pre-K? These are perfect!! Thank you!! CLM – The sign you are looking for is the Pre-school sign. It is the very first one, right above kindergarten. These are great! We used the 2nd grade sign yesterday. A specific Pre-K sign would be awesome, though. We distinguish between preschool and Pre-K in our area, and my other child is entering Pre-K next week. thank you! i just printed one for my 1st grader. i love it! 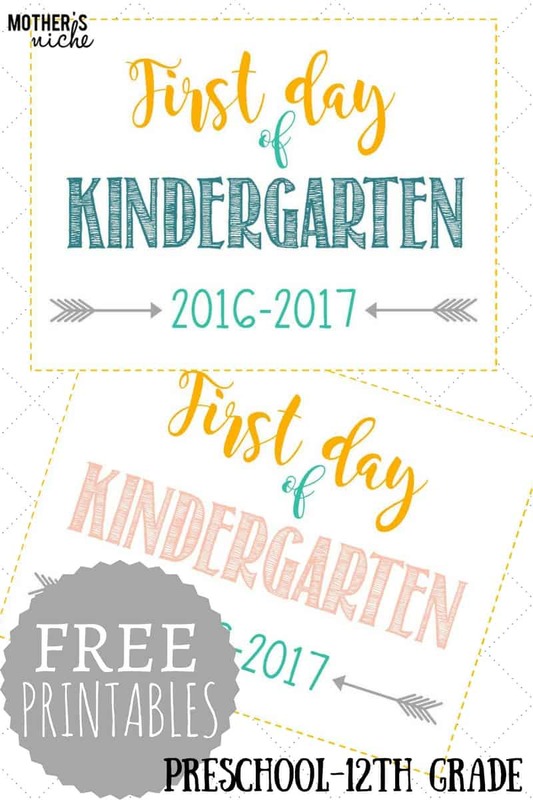 Thank you for the first day of school printable. I will now use these going forward. These are wonderful!! Thank you so much! Will there be some for the last day of school? I love this, the prettiest one I’ve seen! Im driving myself crazy tryingto find the font you used for “kindergarte”, would you mind telling what it is? Hey Jessica! I wondered the same thing. My dad is a computer expert, so he was able to look into the file and find the fonts that she used! The font we both love is called “Return to Sender” 🙂 Hope this helps!! Do you know what font “first day” and “2016” are? What was the name of the other font? 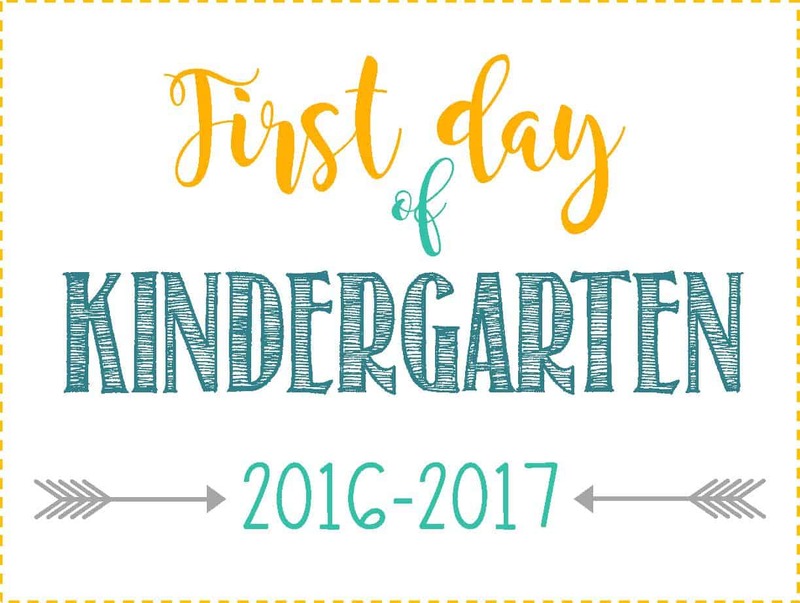 The “first day of” font? Hi, i love these signs! I work at a school for kids with severe autism in Hershey, PA. our first day of school is tomorrow. 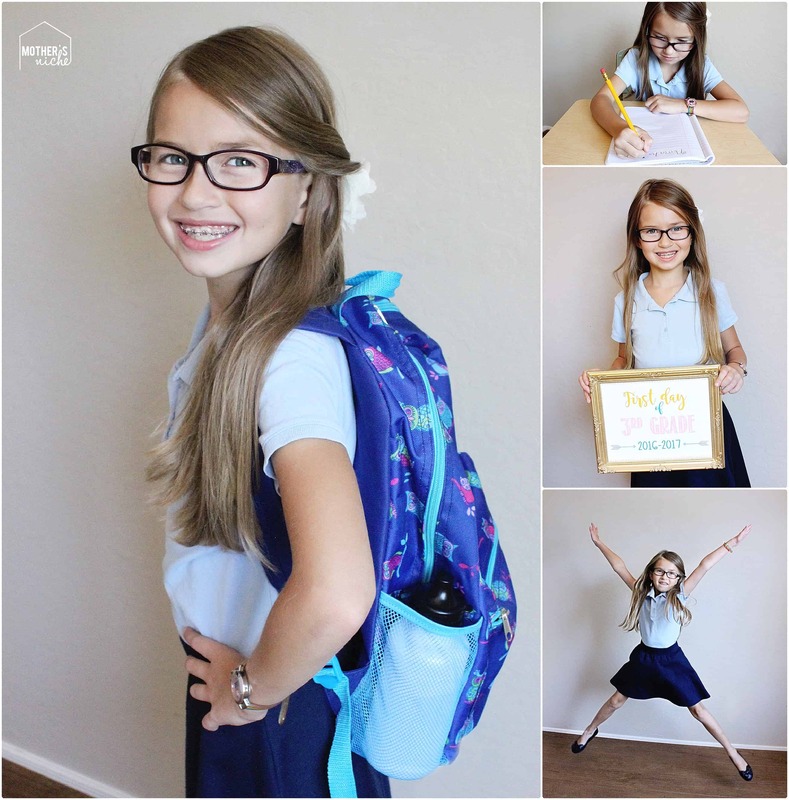 We found a free printable last year that said first day of school that we used for our kids. However, this year I am unable to find one that just says “First Day of School” with the year. Our 7 boys aren’t exactly in grades and our classroom ranges in age. Is there any possible way that you could make a sign that just says First Day of School for us? I’ve written on a few blogs and everyone has directed me to their Etsy shop but we don’t funds to spend on fun stuff like this! So we have to find a free one. If this isn’t possible, no big deal! just thought I’d ask! have a great day! I just added a generic “First Day of School” just for you! Hope you have a terrific school year! So glad you added that one! My daughter won’t be going to school this year, but since we are taking pictures with all her big brothers and their signs, she wants to hold a sign too. I wasn’t sure what I’d do about that but the first day of school sign is just perfect! Thanks! Sooooo happy to find your signs. I bought a cute chalk board at Target but had a horrible time trying to write nice on it! Your signs were even better! Thank you!!! These are awesome!! Do you have last day of school too? These are the best ones I have seen by far! Love that they are something different from the chalkboard style. is it possible to get them without the school year shown, so we could use them for future years (i.e. so my daughter can use them every year of school)? Thanks! Hi! Love the signs very much! Can you please share what font you used for the grade level? i.e. “kindergarten”? I’d love to know. Thanks! I’m pretty sure the font is “Return to Sender.” You can download it free online. Would you be able to make one that says 4k? I love these, but our school calls it 4k instead of preschool. Hi! What fonts did you use? I really like them and would like to use on other projects. Thank you for saving me so much time in making my own. Yours are perfect! Is there any way to download it to edit it so I can change it for the coming years? Mama Thank you so much! Adorable Signs! 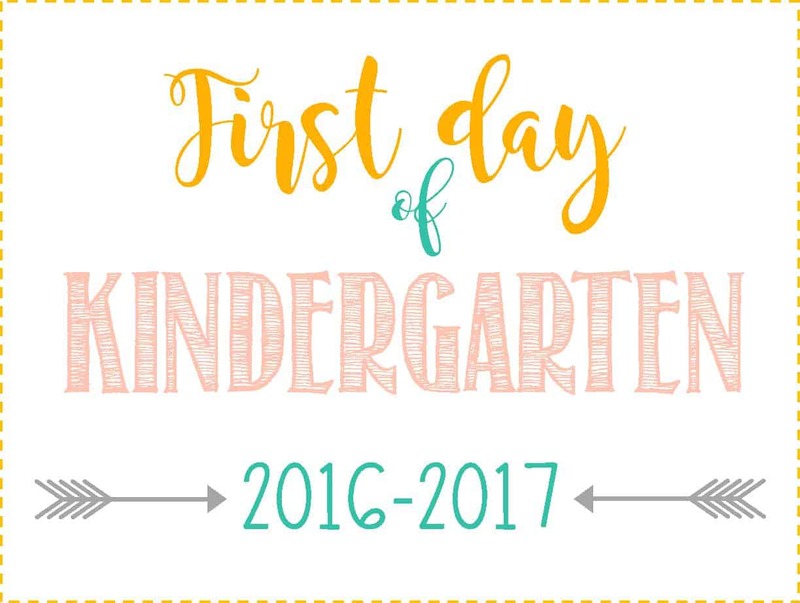 Can I ask what font you use for the “first day of” portion? I’ve seen it before but cannot find it anywhere. I’d really appreciate the help! Is there a last day sign?? Any chance you will be making last day signs? Will you be making a last day of school sign? Could you make a last day of school sign? I would love to be able to compare with the first day with the same sign design 🙂 Our last day is soon! Do you have last day of school printables available? I was hoping to use the same one for my daughter. Thanks! I was also hoping for a coordinating Last Day sign! Would love the same sign for comparison – thanks! Love these signs!! We used the First Day or School one just wondering if you will be making Last Day of School ones? I was also wondering if you could share a “Last Day” sign. Thank you!! I too am wondering if you will be adding a last day sign as well. Hope so! We loved the first day sign. Thanks! Do you have matching last day of school printables? Do you have a last day of school printable that looks just like these? Thanks!! Do you have this free printable with 2017-2018 on it??? Hi there! Are you going to be making more of these for 2017-2018?? My daughter starts next week! I am also wondering about 17-18 signs? I love this sign with the arrows. Can you do this design without a year? Hoping to use the same design every year and that way I could print them all to use and just write the year in! Can you update the year pretty please? Hi Kim, This year’s version is linked in the post. Any chance you would be willing to make the 2016 version with 2017-2018. I”m obsessed with the arrows and colors! The 2017 version is different than the 2016 one, which I like the design & colors much better! I’m bummed like the others that last year’s version wasn’t updated. 🙁 Hopefully you can have an updated version next year! These are awesome! Do u make last day of school ones? Or I can make it but I want the font of kindergarten! Hi there! Love your signs!!! I was wondering if you have any signs for the 2018-2019 school year? Hello! I used your sign last year for my daughter for her 1st day of preschool. The picture turned out great! Do you have 2018-2019 signs available? Hi would you be able to email me the updated year first day of preschool boys sign? His first day is tomorrow!! The link at the top of the page for updated year isn’t working for me. Thanks so much!